Just how casual the Tibetans in exile are in dealing with scholarly works on their history and social reality in ancient Tibet is shown by an example from the Tibetan Review, the English-language mouthpiece for the exile community. In April 1991, the renowned American historian Melvyn C. Goldstein could publish an article in which he presented for discussion a picture of Tibetan history that contradicted the official line from Dharamsala. In the subsequent debate a Tibetan scholar candidly admitted that Goldstein’s investigations were so well documented „that he is probably correct in his analysis” — and then the Tibetan continues, „But his presentation has succeeded in deeply offending most Tibetans” (Tibetan Review, January 1992, p. 18). One can safely assume that official statements from Dharamsala will defame as communist propaganda every historical analysis of Tibet which strives for neutrality. To give a further example, we quote their reaction to A. Tom Grunfeld‘s well-researched book, The Making of Modern Tibet. „This book”, a review in the Tibetan Review says, „can only be considered a sophisticated presentation of Peking’s version of events. Although a lot of material is included in the book which is often overlooked by pro-Tibetan, and the author has evidently made an attempt to be impartial [! ],his Sinocentric and Marxist seen to be so extreme that he is quite unable to master them” (Tibetan Review, July 1989, p. 13). Western observers have in the meantime become more and more blind to the shadowy sides of the Tibetan monastic state. In countless recent books and publications the Tibet of old is depicted as a peaceful state, a sanctuary of calm, the heart of compassion, an ecological oasis, an island of wisdom, a refuge of knowledge, a home of the blissful — in short as a lost earthly paradise, inhabited by enlightened, peace-loving people and mysterious, shining gods. As early as the 1940s, Marco Pallis praised the Tibetans as “one of the earth's most civilized peoples” (quoted by Bishop, 1989, p. 231). “All the residents of Lhasa, rich and poor, high and low, are peaceful”, we can read in a contemporary report. “Even the beggars of Lhasa have only to ply their trade for some time in the morning to get enough food for the day. In the evening they are all nicely drunk. The people of Lhasa were physically relaxed, mentally contended and happy. The food of the city is also nutritious. No one has to strive to make a living. Life takes care of itself, as a matter of course. Everything is splendid” (quoted by Craig, 1997, pp.86-87). The Kundun also knows to only report only the most positive aspects of the past of the Land of Snows: “The continuing influence of Buddhism produced a society of peace and harmony. We enjoyed freedom and contentment” (Panorama no. 553, November 20, 1997, p. 2). Or at another point: “A poor Tibetan had little cause to envy or be hostile towards the rich lord of his estate, then he knew that everybody harvested what he had sown in his earlier lives. We were quite simply happy” (Panorama no. 553, November 20, 1997, p. 2). This image of a poor, deeply religious, pure, and blissfully happy Tibet has meanwhile become fixed in the consciousness of millions. It has become a favored topic in, amongst other things, the esoteric literature, but above all in the American film industry. The actor Brad Pitt, who played the role of the German teacher of the Dalai Lama, Heinrich Harrer, in a melodramatic story (Seven years in Tibet), came to the following conclusion once the film had been shot: “Look at the Tibetans, how poor they are in material terms. And then look at them, how happy and peaceful they are, and their attitude to life with which they go their way. This is simply fantastic. It gets under your skin. It is the hearts of the people which make Tibet into Shangri-La, into paradise. In America this has become a real movement” (Panorama no. 553, November 20, 1997, p. 1). Such glorifications have spread like wildfire in recent years. “The result is a one-sidedly bright image of spiritual purity”, writes Tibet researcher Peter Bishop. “Many contemporary western studies go to the great length to avoid confronting the shadow side of Tibetan spirituality. One can often encounter a sociological naiveté that stands in stark contrast to claims of scientific scrutiny” (Bishop, 1993, p. 73). In contrast, among the majority of the earlier travelers, the Tibet of old made a deeply negative impression, at least with respect to its social situation, which are these days all too readily dismissed as imperialist arrogance and European racism, although identical criticisms of social conditions were also articulated by admirers of Tibetan culture. Alexandra David-Neel, for example, was just as repelled by the general misery of the country as by the corruption of the priestly caste. Even such a fanatic devotee of the Kalachakra Tantra as Nicholas Roerich complained about the general decadence in the Tibet of the time. Likewise, Heinrich Harrer does not paint a rosy picture of Lhasa in the forties, but rather depicts the land as an unjust albeit fascinating anachronism. In his world famous travelogue, Seven Years in Tibet, the German mentor of the young Dalai Lama writes: “The power of the monks in Tibet is unique and can only be compared to a strict dictatorship. They keep a mistrustful eye on every influence from outside which could threaten their power. They themselves are clever enough to not believe in the limitlessness of their strength, but would punish anyone who expressed doubts about this” (Harrer, 1984, p. 71). Dozens of such assessments like that of the “Dalai Lama’s best friend” can be found in the early literature on Tibet. Many visitors prior to the year 1959 report that dictatorial decisions, the arbitrary use of power, brainwashing and paranoid belief in demons, spiritual control and crawling servility, bitterest poverty and oriental wealth, slavery, serfdom, hunger, diseases, a lack of any hygiene, alcoholism, cruel punishments, torture, political and private murder, fear and violence, theft, robbery, and mutual mistrust were everyday features of the kingdom of the Dalai Lamas. The Chakravartin from Lhasa ruled over a vale of tears. Of course, these negative conditions in no way exclude the possibility that the Land of Snows also had oases of peace, equanimity, erudition, joy, helpfulness, noble-mindedness, or whatever all the Buddhist virtues may be. But what is peculiar about the current image of Tibet is that it only stresses its bright sides and simply denies and represses its shady side. For centuries, the education system, the administration of finances, jurisdiction, and the police lay in the hands of monastic officials. Bureaucracy and sacredness have long been compatible in Asia. Hence we are familiar from the Chinese example with a boring Confucian heaven of civil servants, inhabited by heavenly emperors and their ministers, mandarins, scribes and administrators. Such images are also known in Tibet. We may recall how bureaucratic the administrative structure of the wonderland of Shambhala was even imagined to be. The social structure of the Tibet of old in no way corresponded to an ideal-typical model of happy individuals it is so often depicted as being. Alongside the omnipresent clergy, the country was ruled by circa 150 to 300 “secular” families. Different groups were distinguished among the aristocracy. The highest stratum traced their ancestry to the old Tibetan kings, then followed the members of the Dalai Lamas‘ families. These were ennobled simultaneously with the enthronement of the new god-king. Every family in the country was proud to have a monk as a son. For aristocrats, however, it sufficed that the novice spend just one night in the monastery in order to — for an appropriate fee — be considered ordained. Equipped with the considerable privileges of a lama he could then return home. The absolute majority of the sedentary population were the “serfs” of a wealthy ruling elite, and saddled with high taxes. The lives of these Tibetans was hard and frugal, they were badly nourished and the medical services now praised in the West were largely unsuccessful. Forms of slavery were known up until the twentieth century — something which is denied these days by the Tibetans in exile. As in India there was a caste of untouchables. Among these were to be counted beggars, prostitutes, blacksmiths (! ), fishermen, musicians and actors. In many parts of the country members of these stigmatized groups were not even permitted to become monks. In contrast, the nomads preserved a relative autonomy, in relation to both the clergy and Chinese or Mongolian invaders. This was even true of their customs and traditions. For example, the killing of animals — strictly forbidden in Buddhism — was normal practice among them. The monks in Lhasa — none of them vegetarians — had the animals slaughtered by Muslim butchers who thus brought the bad karma from the killings down upon themselves, then the consumption of meat is not a “sin” for the Tibetans, but the slaughter of animals decidedly is. The Fourteenth Dalai Lama, himself a meat-eater for “reasons of health”, nevertheless campaigns constantly (in the West) for a vegetarian lifestyle. On the basis of the doctrine of karma, the privileged strata of the Tibet of old saw their advantages as a reward for previous good deeds in past lives. Anyone born into the lower castes had a badly led past life to blame for this and was marked from the outset as a former villain. Such degrading judgments are still prevalent among the Tibetans in exile. Rebecca Redwood French reports on a case, for example, where a child who made strange noises and threw a picture of the Dalai Lamas to the ground was recognized as the reincarnation of a dog (Redwood French, 1995). One can imagine how easily such classifications could lead to a general social arrogance and the abuse of power. On the basis of a western orientation towards democracy and human rights, we would have to describe the Tibet of old as a totalitarian state. The legal system was for three hundred years unchangingly based upon the Ganden Podrang Codex which was commissioned by the “Great Fifth”. Yet criminal law was already codified in the thirteenth century by the Sakyapa sect. It displayed a strong Mongolian influence, was derived from the Yasa (statute-book) of Genghis Khan, and, like the penal system of the European Middle Ages, was extremely cruel. 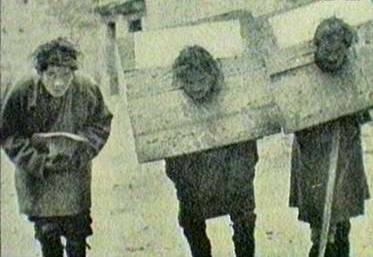 Bizarre mutilations like blindings, the cutting off of limbs or tearing out of tongues, deliberately allowing people to freeze to death, the pillory, shackling, yoking, lifelong imprisonment in damp pits all count as common punishments up until the 20th century, even after the Thirteenth Dalai Lama had introduced a number of moderation’s. In 1940, a British envoy still saw „all over Tibet […] men who had been deprived of an arm or a leg for theft” (Grunfeld, 1996, p.24). Since Buddhism fundamentally forbade the killing of a living creature, criminals were often tortured to the point of death and then left to fend for themselves. If they now died of the consequences this was purely a matter of their own karma. These days the power elite in Dharamsala maintains an embarrassed silence about such inhuman acts and brushes them aside as Chinese propaganda; western observers of the Tibet of old and their reports are considered to be prejudiced and examples of European arrogance. It is truly astonishing how this obscuration of their own dreadful past by the lamas in the West has succeeded. And there is a lot of authentic photographic evidence; a public whipping, which took place in the middle of Lhasa in 1950 was reproduced in the American magazine, Life, for example (Life, November 13, 1950, pp. 130–136). The punishment of criminal delinquents was by no means confined to this world, rather the monks condemned people to millions (!) of years in the most dreadful hells, more grotesque and sadistic even than their counterparts in the Christian Middle Ages. Voltaire’s cry of “Remember your cruelties”, by which he primarily meant the politics of the Christian clergy and with which he launched his struggle for human rights, ought to be heard in Dharamsala as well! Equality before the law varied in Tibet according to social status and wealth. For a murder, one had to pay a so-called “life tax” (mistong) to the surviving dependents and could thus avoid criminal prosecution. According to a statement from one of the current Dalai Lama’s brothers, this practice was still being followed in the mid-twentieth century. The price was naturally related to the status of the victim. Hence, in the fifties the life of a high monastic official was worth between US $8,000 and $10,000. (Grunfeld, 1996, p. 24). For the murder of a woman from the lower castes, 10 Liang (about 11 ounces) of silver was to be paid. The Buddhist clergy was also commercially active and the most important monasteries were regarded as significant trading centers. The lamas even dealt in credit. Production was mostly devotional objects which the monks usually manufactured themselves: holy images, statuettes of gods, amulets, and similar things. As services, soothsaying, astrology, and the performance of all manner of rituals were offered for sale. A further source of income was mendicancy. Bands of monks were dispatched through the country to collect donations. They often returned with great cargoes. The rent for a domestic cell within a monastery had to be paid by the monk’s relatives. If this was not possible, then the novice had to earn his keep. Franz Michael thus referred to the Tibetan monastery as a „private, profit-making, ‘capitalist’ enterprise. It was capitalist in the sense that the manager’s [the administrator of the monastery] aim was clearly and admittedly to make the greatest possible profit for its owner, the incarnation [of the abbot]“ (Michael, 1982, p. 49). The Lamaist dispensaries bloomed splendidly. The excreta (stools and urine) of higher tulkus were manufactured into pills and sold as valuable medicines. The supreme palliative was of course the excrement of the “living Buddha” (Kundun). When the Fourteenth Dalai Lama was staying in China, his chamberlain collected his excrement daily in a golden pot so as to then send it to Lhasa to be manufactured into a medication (Grunfeld, 1996, p. 22). Traditional Tibetan medicine, now on offer worldwide, and which the western admirers claim can cure cancer, had to be content with less success in its home country. The majority of the population suffered from sexual diseases. Smallpox was widespread and even the Thirteenth Dalai Lama fell victim to it. There is no question that the lamas constantly employed their charismatic religious aura to amass worldly power and to generate personal grandeur. “The original Buddha teaching”, Matthias Hermanns writes, “of the 'flight from worldly life‘ was transformed into the Machiavellian principle of unrestrained, moral-free power politics” (Hermanns, 1956, p. 372). Only the monks would never have called it this. It was a part of their ruling ideology to present every expression, no matter how secular and decadent, as the decision of a deity. An important instrument of Tibetan power politics was the political intrigue. This is admittedly a universal phenomenon, but in Tibet it developed such a high status because the worldly resources available to the lamas were barely adequate to the task of controlling central Asia. Above all there was only a rudimentary army. Hence, time and again it was necessary to seek armed allies, or to play armed opponents off against one another. The great abbots, regents and Dalai Lamas have made extensive use of these strategies over the course of history. They were masters of the game of political intrigue and were for this reason as much feared by the Chinese emperors as the Mongolian Khans. Poison and assassinations dominated even the internal Lamaist scene. Not all “living Buddhas” reached the age at which they could govern. As we have already described above, the four divine children (the Ninth to Twelfth Dalai Lamas) fell victim to powerful cliques within the clerical establishment. The great abbots were especially feared because of their magical abilities which they employed against their enemies. Alongside the authority of state, magic was the other significant control mechanism of which constant use was made. It played a more important role at an elevated political level than the bureaucratic administration and international diplomacy. The marked differences of opinion in the assessment of the Land of Snows and its culture are not just a product of the western imagination, but must likewise be explained in terms of a gaping disparity between Lamaism’s own ideal-typical claims and an “underdeveloped” social reality. A devout Tibetan Buddhist tends to have his eyes fixed upon the ideals of his doctrine (Dharma) and to be blind to the social realities of his country. This is almost always true when the Tibet of old is concerned. As Tantric, the “law of inversion” also grants him the possibility of seeing all that is bad and imperfect in his surroundings as the formative material for the work of spiritual transformation, then according to logic of inversion Vajrayana makes the base social reality into an element of the becoming whole, into the prima materia of the tantric experiment. It goes without saying that the lamas thankfully adopted the western ideal-world vision of a peaceful and spiritual Tibet. They combined this with images of paradise from their own, Buddhist mythology and added historical events from the times of the Tibetan kings to the mix. The result was the picture of a society in which all people had lived happily since time immemorial, with a smile on their face night and day. All the needs of a meaningful human existence could be filled in the Tibet of old; nothing was lacking. Everyone respected all others. Humans, animals, and nature lived together peacefully with respect. The ecological balance was assured. The Tibetan kings ruled like goodly fathers and the ecclesiastical princes followed in their stead. Then came the Chinese military with guns and artillery, enslaved the people, tortured the priests, destroyed the culture and planned to totally exterminate the Tibetan race. With such or similar images, the Fourteenth Dalai Lama has up until most recently largely succeeded in implanting the image of a pure, noble, humane, ecological, spiritually highly developed Tibet, this stronghold against materialism and inhumanity, in the awareness of the world’s public. Even the German news magazine, Der Spiegel, normally extremely critical of such matters, becomes rapturous: “Tibet as a symbol of the good, as the last stronghold of spirituality, where wisdom and harmony are preserved, while the world lies in darkness and chaos: Has the 'Roof of the World' become a projection of all our longings? What is the secret behind the western fascination with this distant land, its religion and its god-king?” (Spiegel, 16/1998, p. 110). But under the pressure of the vehement critique of the history of the country which has been building since 1996, and which can table indisputable evidence, in Dharamsala one is also becoming more careful of unrestrainedly glorifying the Tibet of old. For this reason the Dalai Lama ever more often now employs the handy formula that Tibet, like all nations, has its good sides and its bad sides; the future will, however, only stress the good. That is more or less all. Hence, the shadows which cast their pall over the history of the Land of Snows are only referred to in very general terms — roughly in the sense that where there is much light there is also much darkness. It is not our task here to offer an assessment of the improvements much praised by the Chinese which they claim to have brought to the medieval country. We personally believe that in social terms the Tibetan people today live better than they did under the rule of Lamaism. But we in no sense mean by this that the current social situation in the Land of Snows is ideal. We hold many of the accusations and criticisms leveled at Beijing’s “minority politics” by the Tibetans in exile to be thoroughly relevant. It can also not be denied that resistance to China is today growing among the Tibetans and that it primarily makes use of religious arguments. Like everywhere in the world, there has also been a religious renaissance on “roof of the world” since the mid-eighties. We see a problem in this Lamaist revival, not in the Tibetan democracy movement. What is peculiar and confusing about the political situation is, however, that the clerical revival itself very successfully pretends to be the democracy movement, and manipulates the awareness of both the Tibetans and the West with this deception. On a spiritual plane this bureaucracy corresponded to a meticulously detailed regulation of the monasteries and a dry scholasticism which often resulted in hair-splitting and a unending process of commentary upon the original texts. Thus commentaries upon the commentaries upon the commentaries on a particular Tantra arose . The Tibetan pleasure in the eternal repetition of the same formulas, the untiring circling of the same topics had led to the invention of the prayer mill — a unique construction which most vividly demonstrates how mechanistic and stereotyped this religion was. This was a metal cylinder, which was rotated for hours by hand by believers, usually with the mantra om mani padme hum on their lips. 5. BUDDHOCRACY AND ANARCHY: CONTRADICTORY OR COMPLEMENTARY?